Utrecht is one of the big cities in The Netherlands, albeit still one of the lesser known ones on a global scale. It is quite an amazing place to visit, even the canals which are present in this town are different in a way from the other ubiquitous canals in The Netherlands. 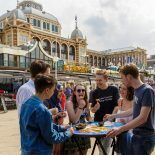 One must visit this town to discover a great side of Holland, an ideal mélange between all the convenience present in any modern day city and the old world charm present in a laidback village, this aspect is what makes this town quite special. Of Course perhaps the most famous landmark in this town would be Domtoren, which can be seen pretty much anywhere from the town. This tower dates back to the 13th century. If you have a fair amount of stamina then I would advise to climb the stairs and get to the top, where a breathtaking view waits you, however at 465 steps and 112m it certainly is not a cakewalk! Alongside the Domtoren the canals of Utrecht are also quite fascinating, Leiden being a canal town is quite special in itself but the canals of Utrecht have their own right to be admired. These canals are placed on two levels which is perhaps what makes it quite unique! Apparently the two level canal system enabled the storage of cargo at water level, quite ingenious! One of the best ways to see the town in a charming way is to take the boat tour. Its costs about 10 euros but is well worth the price, in about half an hour you would have had a good idea about some of the best spots in this charming town. Once you are done with the old town and the canals and a boat cruise, it would be wise to head over to the Castle de Haar, this is one of the more unknown places in Netherlands but certainly worth the visit. This is apparently the largest castle in Netherlands and also possesses fairy tale looks! After all the sightseeing an ideal way to relax would be to head to the Botanical gardens, one of the most peaceful places in this town. This garden is also home to an incredible collection of plants which has been obtained from all over the world! This is a garden which is complete in everyway and even houses a waterfall! Utrecht is indeed a must visit city in The Netherlands! This entry was posted on February 28, 2015 by admin@theleidener in Deepu, Living in Holland and tagged Deepu, photos, Utrecht.